Brand New MacBook Pro Retina bad battery? Your battery is charged and ready to go, so you can start using your Mac right out of the box. However, the battery was completely drained. It charged up fairly quickly (I didn't time that, however) and the device functions fine. I used it off and on for a total of around 40-45 minutes this morning -- usual web surfing with maybe 2-3 minutes of video, max. This took the power level down from about 94% to 75%. Then I closed the lid to see how the battery would hold up while the device slept. After 8 hours away at my office, I came back to find it at 70% (down from 75%). Question Should the lack of charge out of the box be reason enough to return this thing? And is the draw-down on power I described indicative of the normal, expected battery performance? The rate of degradation depends greatly on how the battery is being charged and used. It is recommended that you should attempt an SMC reset first. While it should be safe to use your Mac given the "Service Battery" notification. You may want to bring it in store for a check if SMC reset proves ineffective in your case. 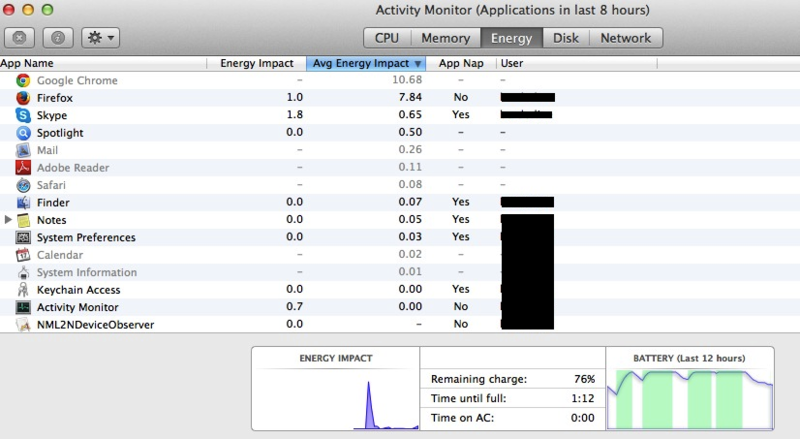 Best is to use Apple tools already on your Mac to check your battery. Open Activity in utility folder- and look under the the Energy tab. Look for battery information there. Fully charged capacity (>6500 mah), --that is a good indicator how "old" is the battery, the older they get the lower is the Fully Charged capacity number.